Alma Rosa Winery & Vineyards was founded in 2005 by pioneer winegrowers Richard & Thekla Sanford. The name, which translates to “soul of the rose,” is a tribute to the original Santa Rosa land grant on which the estate vineyards are planted. Dedicated to crafting high quality, vineyard designated wines that reflect the unique character of the Sta. Rita Hills AVA, Alma Rosa focuses on Pinot Noir, Chardonnay and other cool-climate varietals that thrive in this special region. As the first vineyard in Santa Barbara County to be certified organic, Alma Rosa is proud to carry on that tradition through its dedication to organic farming and environmental stewardship. 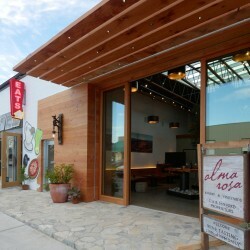 Alma Rosa wines can be enjoyed in the inviting urban setting of their tasting room located on Industrial Way in Buellton. Private tastings are also offered at Alma Rosa’s El Jabalí ranch in the heart of the Sta. Rita Hills, providing a rare opportunity to sample the winery’s most limited-production wines in a historic setting.